1 worst dolls | This Blog Rules | Why go elsewhere? Dolls are great, aren’t they? They are cute, cuddly and loveable. Except the ones that aren’t. These are the worst dolls ever created and they are annoying, pointless or frankly a bit scary. 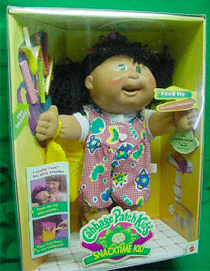 If I’m being perfectly honest – and while not wanting to upset anyone – I hated every version of the blasted Cabbage Patch dolls. However, there is one lot which stand out head and shoulders above the rest of the rotten bunch. The Snacktime Kid was a monumental doll fail. They just kept on chewing and chewing and, well, chewing. After an obscene amount of relentless chewing dozens of kids got bits of their bodies chewed. The maker stopped selling them and offered refunds to the saps who had already bought them. What a bizarre concept. 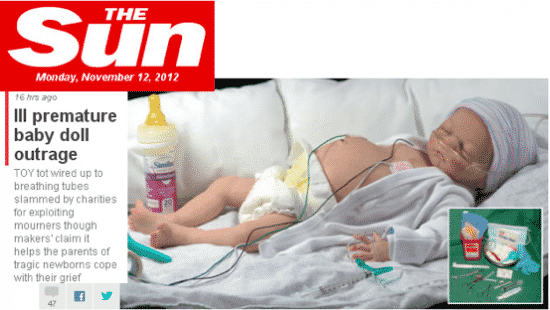 The release of a stylish new premature baby doll was met with outrage. It featured the little tot hooked up to breathing tubes and other hospital equipment. This doll isn’t actually all that bad looking or anything. After all, it’s our old chum Mr Snuffleupagus. Who could hate a dude like that and call him one of the worst dolls ever? No, the problem I have with this doll isn’t anything to with our Sesame Street buddy with the snout and the obscene amount of body hair. Rather, I feel that the production is a waste of the capabilities of modern technology. 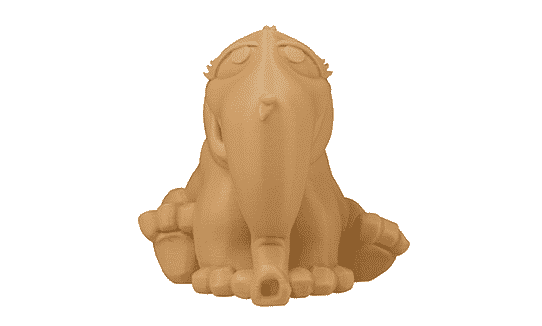 You see, you can download the file that allows you to print off this as a doll using dazzling 3D printing technology. Shouldn’t we be using 3D printers to print off useful stuff like artificial legs, food for starving kids and clones of Jimi Hendrix? 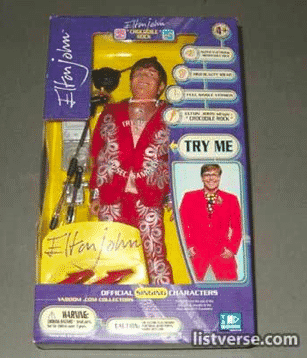 Maybe I’m in the minority here but I can’t think of a single person I would want to give an Elton John doll to. What would you do with a think like that, anyway? “Try Me”, the packaging screams and that is a temptation we can all resist fairly easily, I reckon. One the plus side, I can just about make out that he sings the classic Crocodile Rock and that he is in some way “official”. Despite these reassuring pieces of information this product still has a feel of “extremely limited market appeal”. This doll doesn’t exactly boast of an uncanny resemblance to the person it is modelled on, does it? If it wasn’t for the jacket and the white glove it could really be anyone who has ever lived. Actually, it looks nothing like my Aunt Betty. Or my Uncle George for that matter. It doesn’t really look too much like me either. 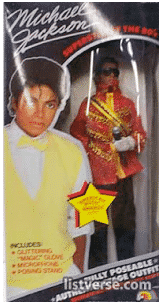 Ok then; it would look like a relatively large number of people who bear some sort of passing resemblance to Mike. What is happening with the world? 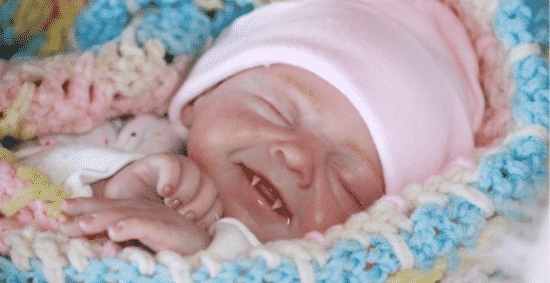 When I was a kid, baby dolls rarely had fangs and almost never scared me. It seems as that there is currently a craze for these things and I have no idea why. 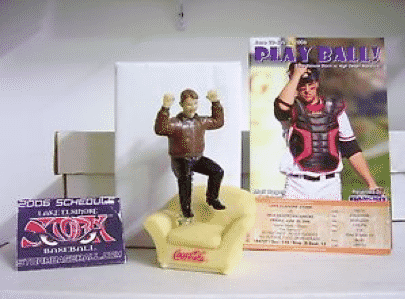 So you liked Tom Cruise jumping on the couch on Oprah so much that you would like a doll commemorating it? Have you considered the fact that you might be just a little bit strange? This is one of the worst dolls showing one of the weirdest moments in the history of television.